J-2 Granny Still Sparkles 🙂 estimated 103 years alive! L-87 Onyx 22 year old male orphan adopted by J-2 estimated 103 year old Granny! People ask me if I get weary of tourists and visitors. I don’t. I see and experience place and wildlife through their fresh eyes and questions, re-igniting the passion I live, and opportunities to reconnect us humans to our ecosystems. We Marine Educators joke about the most frequent question: What time will the whales come by? I usually answered 3pm. Today I was out at LimeKiln Lighthouse sharing education and outreach on behalf of the Whale Museum, when I was asked this. I shared about Bob Otis’ research that analyzed 20 years of sightings that showed 3pm (my previous humorous guess) edged out over other times that Orcas were sighted! Today, however, based on my years of observations, and the intelligence, awareness, and adaptability of marine life, cetaceans particularly will often utilize their environment; the tides and currents to their advantage, with less energy expended, and IF they were in the area, IF they were in the Strait of Juan de Fuca, they may head up Haro Strait within the last 2 hours of a strong flooding tide. Today’s incoming tide was about 8 feet, peaking around 6pm. So I guesstimated, hopefully, we might see Orcas around 4pm. Honestly, I was delightfully surprised when we first noticed some Harbor Porpoise in Haro Strait, then a large amount of boats off in the distance in the Strait of Juan de Fuca, then, then breaching Orcas at about 4pm!! It looked like a large group that split as they got closer to San Juan Island, and 2 sub-groups headed up mid channel Haro Strait past the lighthouse. The warm wonderful summer sunshine made it difficult to see saddle patches and identify the individuals. The first sub-group turned around north of the lighthouse and slowly swam back against the tide, the female coming to the shoreline. It was J-2 Granny!!! She swam and played, turning upside down in the bull kelp beds! Was she utilizing a coastline countercurrent? 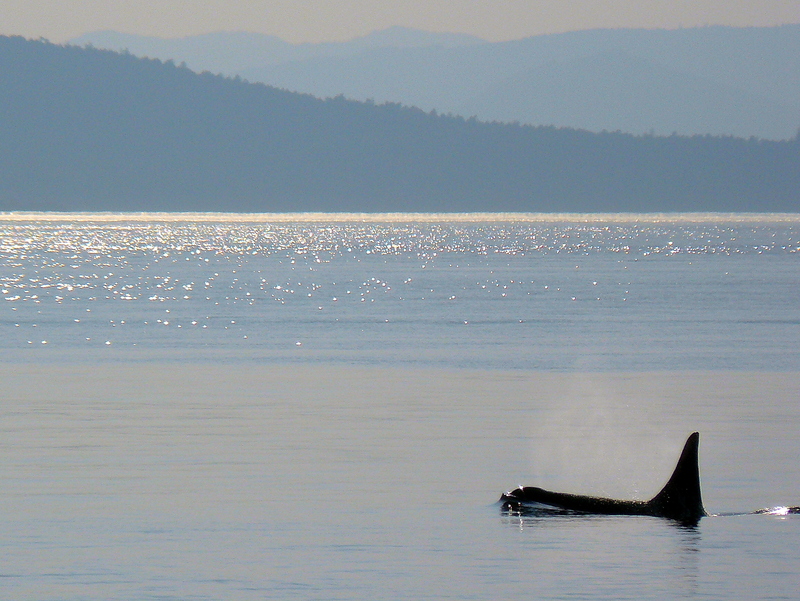 We were all touched and awed to experience such a close, visible sighting of an estimated 103 year old Orca! 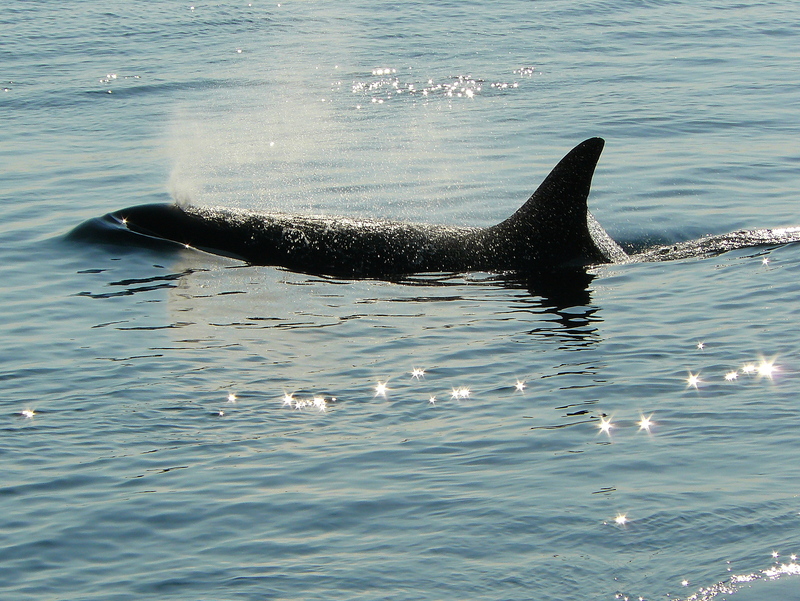 We were also able to identify her 2 male traveling companions out in the strait, L-87 Onyx and J-34 Doublestuf. Harbor Seals were hanging out in the kelp beds too, relieved they were the fish eating Killer Whales! Had J-2 Granny and the boys cruised by checking for Salmon? For 2 hours, 4pm-6pm, we were graced with whales. There was also a wedding at the lighthouse delayed as the bride and groom sat on the rocks mesmerized by the whales! Wow! Forever memorable! This Orca visit made all the questions answered and ways how we can help, even more meaningful to folks visiting from many places- Washington, Oregon, California, Utah, a family from India! 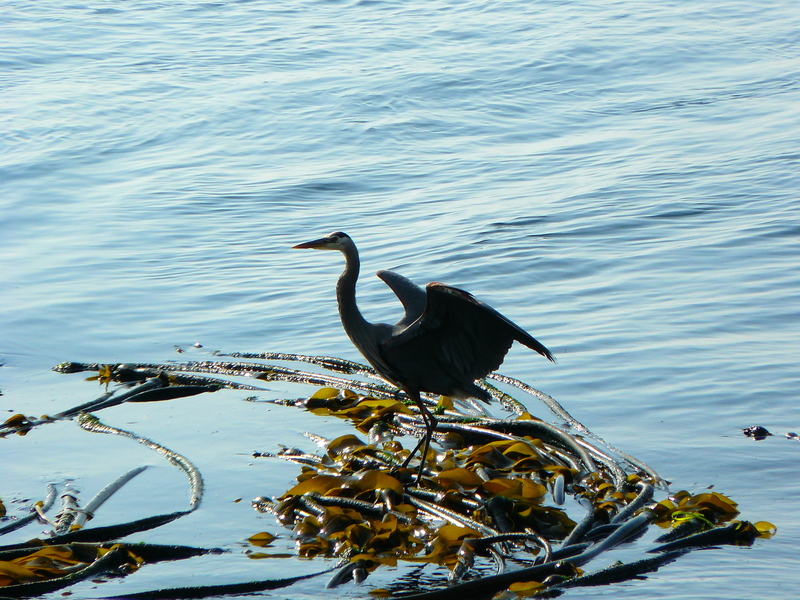 It keeps me hopeful in humanity with this connection to the Salish Sea and magnificent wildlife; that people will be mindful and caring of our impacts on our ocean planet. Glad to see you are back to writing. Eloquently written. Thank you, for sharing your experience. I was on the west side of the island to witness this pass by…a memorable experience indeed!